* 1. Are you a home buyer, home seller or a housing industry professional (i.e., Realtor or Builder)? * 2. How did you begin your most recent search for a home inspector? Better Business Bureau, Chamber of Commerce, etc. * 4. Did you ask to see a sample report before deciding which home inspector to hire? * 5. Did the home inspector explain his contract and have you sign it before conducting the inspection of the property? Yes, he was very thorough and I understood the terms of the agreement/contract. Somewhat, but very quickly and I did not understand the limitations. * 6. 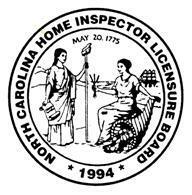 Have you read or seen the NCHILB Standards of Practice that govern home inspections in North Carolina? If "Yes" how did you obtain a copy? * 8. How much time did the inspector spend inspecting the house?